Zzz... *snort* *huff* oh, there you are! Sorry for the long hibernation in blog posts, but I became a bit too used to having GSoC students writing all of them. Bad excuse, and I will try to get back to a more regular schedule, so this post will try to catch up to what's happened the last couple months. To begin with it's probably best to answer the question of when the next release is coming. 0.9 is still quite far off, so we decided to try making a 0.8.2 release as soon as possible, hopefully a beta/release candidate within the year. So you should have something to download in December; whether the final release will happen then or January is still left to circumstance (bugs, first and foremost). We still have about 100 open issues to either solve or postpone, so there's (more than) enough to do for everybody, and if you would like to try your hand at helping us we welcome you, especially if you have some programming or 3D modelling experience. There have been many improvements to the new 3D engine we're using (less and less based on Irrlicht, and more and more custom), and while an image speaks a thousand words, a thousand images in the form of a video ought to be a whole essay. The following video is an engine demo made by our resident artist samuncle. You can watch the video at http://youtu.be/9iklMiy_Y9U and download the "kart" here. Our artist samuncle has been hard at work indeed; check out the improved versions of Adiumy, Sara and Xue, in the tracks Cocoa Temple and Gran Paradiso Island. Oh, now we know. Thanks, Sara! In miscellaneous changes, there's been way too many to list them all, but I'll mention a few very quickly. The main configuration files now have their own sub-folder, so this means that in the future you can have several STK versions running simultaneously without getting issues where one version of the game overwrites another's configuration. Some performance improvements have been made; for example we discovered a certain OpenAL call were slowing things down so we have minimized its usage and also moved sound to its own thread. The following image is of the new screen for when you start STK 0.8.2 for the first time. 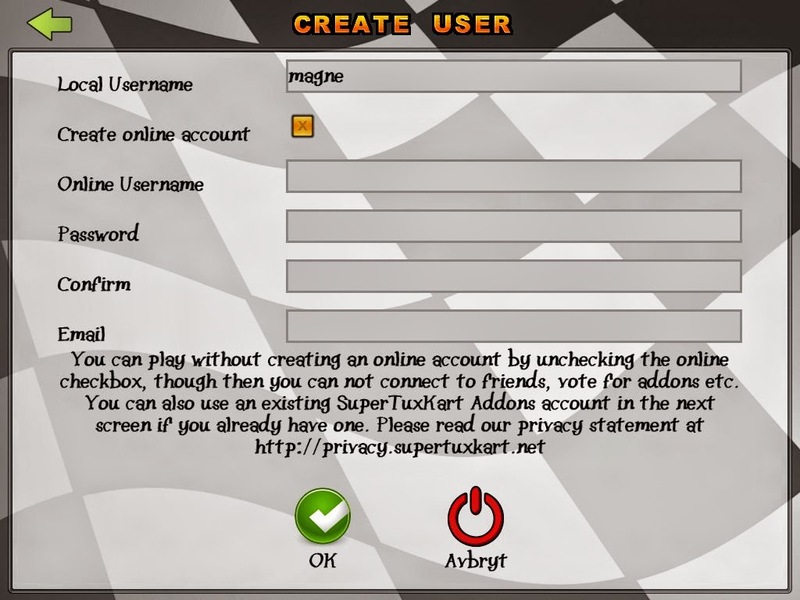 You can now log in immediately to our stkaddons server which will enable you to vote on addons, see whether friends are online and view their achievements. Obviously the use of this feature will be expanded later when we have online multiplayer support and other things finalized. Hope you all are having fun with 0.8.1, and look forward to 0.8.2 which is going to be a quite major minor release... yes, 'tis confusing but ignorance can be bliss, and a stitch in time saves nine, and don't take any wooden nickels, and... later folks, some men in white coats are here to talk with me. Very good. I'm waiting for the release. More or less any openal commands caused problems now and again (! ), apparently even just querying the state. We moved all openal handling into a separate thread, which significantly improved the situation.